New England signings this weekend! Saturday, November 23 from 1:00 – 3:00 p.m.
We don’t know if this is the soundtrack to the book or not but it sure was fun. 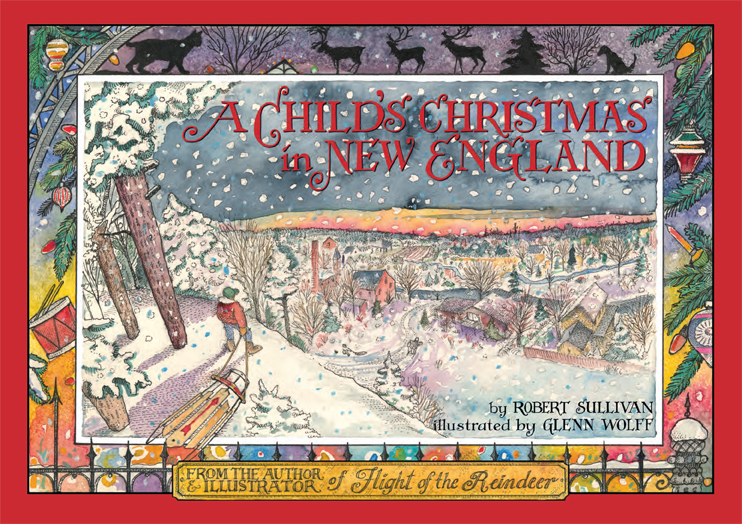 Our goal was to write a new Christmas waltz that was inspired by the book that was inspired by the great poet. We hope you enjoy “Caroline’s Waltz” by Robert Sullivan, Robin Lee Berry, & Glenn Wolff. What a nice surprise today to see these kind words in Publisher’s Weekly. Friends! We lost a few years ago a wonderful man, Frank McCourt, who always had the spirit of Christmas in his heart and a twinkle (a wry, devilish twinkle) in his eye. This top page of the blog is about what a few others have said about our books, and Bob has always been proud that Frank once said that readin’ his writin’ was “like sitting by the fire with a lively and scholarly seanchai, as satisfying as a pint of Guinness or a Connemarra sunset.” Some other folks—some close to us, some further from us; some bidden, but some, like Gregory, not bidden—have already said nice things about A Child’s Christmas in New England. We’ll start with what Greg has said. —Gregory Maguire, author of Wicked. “Master collaborators Robert Sullivan and Glenn Wolff have done it again! shimmered on a towering tree, and the sledding runs went on forever. unwrapped and I’d begin counting the days till Christmas came again. Have fun with the rest of the blog, and Merry Christmas from Bob and Glenn (not the last time you’ll hear that)!